Located at the point of traffic importance since old times and having prospered as a castle town of Himeji-jo Castle, Himeji City attracts many tourists from abroad today. Not to mention tourism industry supported by its abundant historical assets, the City has been developing steadily in manufacturing with advanced technologies and traditional industries existing together. This issue picks up Internal Communication Section, System Management Div., Himeji City. This section is particularly responsible for maintenance and operation of geographic information systems (GIS), and construction of the information system within the agency. Himeji City is positively promoting effective use of information technology (IT) in providing various types of social infrastructures, e.g. by introducing GIS based on "the Himeji City Master Plan" and "the Himeji City Computerization Plan" quickly. In this context, the City also paid attention to the potentialities of simulation and presentation with 3D space with maximal use of VR (virtual reality) and CG (computer graphics) technologies. With System Management Div. as a main operator, the City introduced "UC-win/Road", a 3D real-time VR software product of FORUM8. In connection with multiple divisions in charge of projects, they are utilizing it in various stages of creating urban spaces. From a view point of maintenance and operation of the environment of using this 3D space simulation system, we interviewed Mr. Yasuki Fujimoto, Section Head of System Management Div., General Affairs Dept., Mayor's Office, Himeji City, and Mr. Kazunobu Miki and Ms. Rie Nakanishi of the same Div. From another view point of applying the system to the provision of social infrastructures, we interviewed Mr. Hirofumi Yanagawa, Section Head of Street Construction Div., Road Dept., Construction Bureau, Himeji City. Located in Southwest Hyogo, Himeji City lies mainly on Harima plain with its north side abutting on the Chugoku mountain range and its south reaching the islands in the Inland Sea of Japan. The City has a population of approximately 536,000 (as of May 1, 2009). It is Himeji-jo Castle that is known as symbolic presence of the City widely. It is said that the castle was built in 14th century, and that the framework of the existing castle was constructed during the Keicho era (early 17th century). It was designated as a national treasure in 1931, and was placed on the World Heritage List (as a cultural site) of UNESCO (United Nations Educational, Scientific and Cultural Organization) in 1993. Various events are held in commemoration of 400th anniversary of the castle construction this year, while the conservation works of the main tower is going to be carried out by stages from autumn. 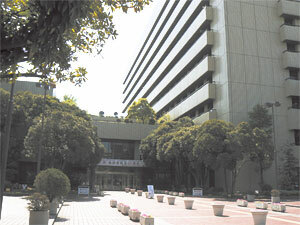 Himeji City was also designated as a "core city" for the first time in the whole country in 1996. This is a system founded under the revision of the Local Autonomy Law (1995). If a city satisfies the requirement of having a population greater than 300,000 and plays a central role in the region, it is delegated a part of functions usually carried out by prefectural governments equivalent to those of a designated city. The system is getting attention, as it can be a model of decentralization of power, resulting in improvement of public services as well as unique and attractive town planning in consideration of regional characteristics. Responding to the needs of the time based on a long-term view, the City positioned the Himeji City Master Plan as a guide to ensure its sustainable growth. Under such circumstances, the urban structure and industrial structure of the City has changed greatly, partly because of its consolidation with four of its surrounding towns. In addition, its social environment has reached a turning point through the arrival of population decline or diversification of citizens' needs. In response to these, the City developed a new master plan "2020 Home Town Himeji Plan" with a target period of 12 years up to 2020, in March this year. 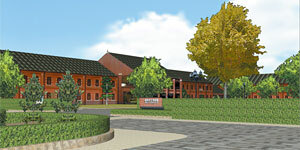 A former master plan, Himeji City Plan for the 21st Century was developed in fiscal 2000 (with a target period from fiscal 2001 to 2012), which mentioned the provision of integrated GIS aiming at qualitative improvement of the administrative service through computerization in connection with promotion of "electronic town hall". The current master plan also takes over its policy to expand this. 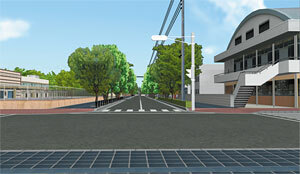 At the same time, Himeji City provides the Himeji City Computerization Plan for the purpose of promoting this master plan from an aspect of computerization. Thus the current computerization plan developed in fiscal 2007 (with a target period from fiscal 2007 to 2011) was revised in order to achieve consistency with the master plan revised in March this year. Mr. Yasuki Fujimoto explains the context of Himeji City coming to introduce the VR CG-based 3D space simulation system before the neighboring local governments; that is, there has been a tendency of encouraging electronic town hall mentioned above as well as the Mayor's understanding of the urban plan for which various types of information are expected to be utilized, in addition to the positive attitude of the City towards utilization of IT including GIS from the beginning. Based on this, he says, "It is the role of us (Internal Communication Section) within System Management Div. to provide the environment for utilizing 3D VR throughout the agency in this task". Mayor's Office of the City covers wide-ranging tasks from the secretary work of Mayor and Deputy Mayor to the entire city administration. Within the Office, System Management Div. consists of Computer Management Section and Internal Communication Section. The former operates and manages the host computer for the work related with Citizens' Welfare including issuing copies of certificates of residence and tax certificates, while the latter is in charge of works such as improving GIS, providing the master topographic map and aerial photograph of the city to the public, and constructing internal information systems and electronic town hall. With regard to the electronic town hall, it has been promoted in accordance with the master plan and the computerization plan of the City. Especially for improvement of GIS, they put emphasis on the development of the master topographic map that reflects the area of the merged towns and support for 3D GIS, in addition to providing GIS for the internal use and on the website. An idea of utilizing a 3D space simulation system occurred to them under such circumstances. As specific scenes of application, they paid attention to the possibilities to use it for comparing and examining different projects, examining the layout of buildings, or examining landscapes in town planning. To what kind of project can the City actually apply it, making much of the advantages of 3D space based on VR / CG technology? From such a point of view, "Study Meeting on Introduction of 3D Space Simulation" was organized in fiscal 2005 with System Management Div. (formerly Computerization Office at that time) as its core, involving those concerned with urban planning, land readjustment, and construction. They discussed the types of system to be introduced, its use, the scope of utilization, and so on. Through a series of examination, they reached a stance that the desirable software product is such one that would allow the staffs to create 3D space data and operate the system for simulation etc. by themselves without outsourcing. 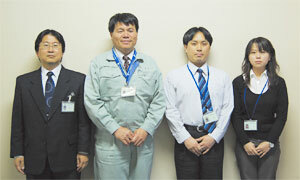 In the next year of fiscal 2006, the Study Meeting was reorganized into "Committee on the Use of 3D Space Simulation". Under the Committee a system that met the requirements of the Study Meeting was adopted, with UC-win/Road as the main part, based on the proposal competition conducted with 3 construction consultant companies. 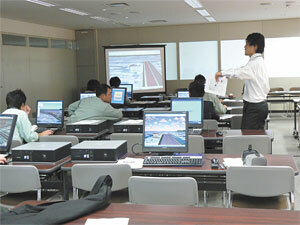 After the system was installed, staffs received training to create data by themselves. 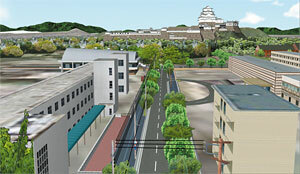 Then they started to work on developing 3D VR data for the current status of the area from Himeji Station to the surrounding part of the Himeji-jo Castle, and "the Eastern Nakabori Route", a part of the project to readjust the historical roads in the surrounding districts of the Himeji-jo Castle (commonly called as "Rekimichi project"). At first, it was so made that each person in charge of a project should create data. However, staffs in charge of projects have their own business, and there are physical constraints such as a license key or the available personal computer for the system. Thus it started with a setup that Ms. Rie Nakanishi supported each person in creating data. Mr. Kazunobu Miki explains that after the system was procured, more and more weight was put on the side of support for practical creation of data. Recently, however, there is a greater trend that the staff in charge of projects should create by themselves, encouraged mainly by the former staffs in System Management Div., who moved to the section of urban planning. For example, a cooperative work is ongoing that each staff in charge creates an individual model using Google SketchUp and Photoshop, and then Ms. Rie Nakanishi integrates them on UC-win/Road. From the left: Mr. Yasuki Fujimoto, Section Head of System Management Div., General Affairs Dept., Mayor's Office, Himeji City; Mr. Hirofumi Yanagawa, Section Head of Street Construction Div., Road Dept., Construction Bureau; Mr. kazunobu Miki and Ms. Rie Nakanishi, System Management Div., General Affairs Dept., Mayor's Office. Since they started to examine introduction of 3D space simulation system, Mr. Hirofumi Yanagawa has been involved with this project consistently from the side of the staff in charge of projects. First, he proposed the Eastern Nakabori Route, which forms a part of "Rekimichi Project", as a target project to which the system should be applied. Rekimichi Project is a development project in consideration of safety and living environment in response to the problem caused by the concentrated traffic and the complicated road network within the district, peculiar to historical urban areas. Especially in the surrounding area of Himeji-jo Castle, there are many historical and cultural assets; therefore, "Roads of History (Rekishi No Michi) "are developed to network the historical roads centering on walk routes along Nakabori (the middle moat). The Eastern Nakabori Route is one of its main target areas. Preserving the current road along the middle moat of the Himeji-jo Castle, a route starting from the site of Uchikyoguchimon (gate) Ato and its surroundings through the site of Kyuchomon (gate) Ato to the Joto Route was redeveloped as a walking space. On that occasion, rockwork gutters and paving materials that looked like the original roads were used to give an impression of the old routes. In addition, electric cables were buried underground and road marking were put for various types of relics with consideration. Then, it was agreed that 3D space simulation could be an effective means in examining the landscape of the project. Firstly the present situation of the concerned section was represented with 3D VR. 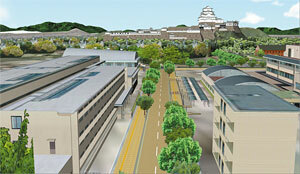 Based on this, points of refurbishment were simulated, including underground electric cables, reconstruction of the surrounding buildings, and ensuring the view of Himeji-jo Castle. Later on, presentation about this work was made at the national-scale conference on "Rekimichi Project" held in Himeji City in October 2006, organized by the Council for Promoting Projects of Environmental Arrangement and Streets in Historical Districts. They received opinions that the images of 3D space simulation was "easy to understand", and questions were focused on it beyond expectation. 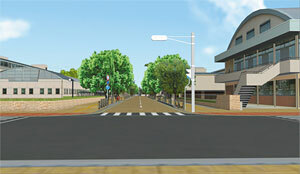 Other than this, the City has made various attempts to explore the potentialities of the system including comparative review of draft plans in "Oshio Gakuen Street" project, landscape simulation of Karoyashiki Ato Park (site where the chief retainers of Himeji used to live) and the museum, and traffic simulation at the Okada intersection. Through these attempts, a certain level of results were produced in presentations made for those concerned with administration such as the city agency or the Council, as they look back, while they position it as a challenge how to lead this into public services such as an explanatory meeting for the residents. For this reason especially, they are willing to provide environment in which more staffs than before can make an effective use of the system along with their own tasks.